Families will find our home meets all their needs with warmth and cheer. Our home is a raised reverse living contemporary with excellent ocean and bay views from the living room, as well as from our upstairs and rooftop decks. The top floor has the master, main deck, living room, kitchen, dining area and 1/2 bath. The house comfortably sleeps 10 in its 4 bedrooms and family room for which we provide Aero beds. Bathrooms are never in short supply with 3 full baths, a half bath and an outdoor shower. The master bedroom on the top floor and junior master on the second floor each have their own TV, deck and bath. On the lower floor there are also two bedrooms that share a bath. The Sea Shell room has two twins and the Boat Room has a 'pyramid' bunk where the lower bed is a full sized mattress which works in a pinch for a third couple that is visiting or the big boys. Both the upstairs living room and downstairs family room have their own deck and TV. The location is perfect for everything you want or need. The front door is just 100 feet to the beach where you have guarded sections both to the right and left. You can fish right at our beach where there are stripers, bluefish, fluke and kingfish. And you can take the kids crabbing at the end of the block on the bay. Our street is one of the last in Harvey Cedars before Loveladies. Our beaches are uncrowded, guarded and replenished nearly every season. You can easily walk into town to go to the market with its breakfast counter, a sub shop, liquor store, gourmet deli and restaurants. And a short bike ride away are Harvey Cedars Marina, where you can rent kayaks and sailboats, as well as Sunset Park where you have public tennis and basketball courts, a baseball/soccer field and a nice pier for bay side fishing and crabbing. The house is loaded with amenities for a family. If you have little ones, you'll appreciate the crib, booster seat, bath seat, bouncy seat and that all the stairs have guards. All of this is hidden away if you don't want to remember when your children were that little. If it rains, there are numerous board games, card games and puzzles in the upstairs closet for your use. And finally, there is high speed internet access with a wireless home network for those of you that can't escape work and e-mail. We also supply beach badges, beach chairs, umbrellas, beach toys, tennis racquets, basketball and soccer ball. We want you to enjoy your vacation just as we do. If you are after pure relaxation, you can go to the house and not get into the car for the week. Enjoy everything the beach has to offer. We are a Princeton, NJ family of five. We spend our annual vacation with extended family at the house as well as special holidays. The house is perfect for these cross generation, multiple family affairs. Young cousins have lots of room to play. Upstairs is a great place for evening cocktails with uncles, aunts and grandparents with its ocean and bay views from the decks and the living room. We have a large open kitchen so when you're fixing dinner you're in the middle of the party and the BBQ is just outside the door on the back deck. The counter and dinner table comfortably seat 12 so you all eat together. Grandparents and parents with little ones in strollers easily access the beach as a new access point with gradual ramps over the dune have been built. The kids run back and forth from the beach for lunch, bio-breaks and naps. Holidays are extraordinarily special here. Families don't dash in and out for just an afternoon. We spend real quiet time with each other as the island is all ours. My favorite times to visit are Columbus Day, Chowderfest, Thanksgiving and New Year's. Harvey Cedars is the greatest family beach location. The kids always find others with whom to play on the beach. Sunset Park provides day camps, play ground, hoops court and tennis. There is easy access to the bay. Town is an easy walk. Tons to do from Surf City to Barnagat Light. Its an unbelievable throw back in time. Location, location, location. At our home, you have nearly everything you need for your vacation within walking distance. The entrance to the beach is 100 ft. from the front door. Immediately to the right and to the left are guarded beaches but if you want to stay away from the crowds, you just plop your chair right where you enter. You can go crabbing and catch a sunset at the other end of our street. Town is a pleasant four block walk. There you have a breakfast counter, two lunch shops, ice cream shop, liquor store, a casual seafood restaurant, a fine dining restaurant and a market with a butcher shop. If you get on a bike, you get to a marina to rent sailboats and kayaks or to a park with bay access, b-ball and tennis courts, playground, fishing/crabbing pier and ball fields which host soccer, lacrosse and baseball day camps. Location, location, location. toilet, combination tub/shower, Full bath in Master which is on 3rd floor. toilet, combination tub/shower, Full bath in junior master which is on second floor. toilet, combination tub/shower, Two sinks. Shared b/w Boat & Sea Shell rooms on 2nd flr. toilet, Half bath next to living/dining area on 3rd floor. shower, Outdoor shower in back of house. 100 feet to beach access. Decks look over the beach. Looks out to the ocean. Full Kitchen with deep center counter with seating for four. The dining area has a dining table that seats eight and stools along the counter that seat four. There is also seating outside on the deck for 10. We further offer a booster seat for a tot. Bicycles can be rented at Beach Buggy in Surf City. Tennis courts are available on an hourly basis at Sunset Park in Harvey Cedars or Loveladies Arts & Sciences in Loveladies. Sea Oaks and Twisted Dune are best. Atlantis and Ocean Acres are least expensive. Pine Hill is best value but farthest although still reachable. There is a community pool with a daily usage fee at St. Francis in Beach Haven. We met here for an off-season family reunion. The house is wonderful: large, clean, light and airy, 4 well appointed bedrooms, 3.5 bathrooms, large kitchen area. It is tastefully decorated and very comfortable. The island was very QUIET. We loved it. The beach was empty, but great for walking, and we could see it from several spots in the house. We even got into the ocean one day. We had a great time and the accommodations were perfect. Thank you for the nice compliments. The fall is always my favorite time of year on LBI. Restaurants and beaches are empty. Ocean and bay are still warm from the summer. Clear, crisp breeze from the north. I'm jealous but I'm glad you enjoyed it. Come back. We had a wonderful week here. The house is perfect for families with children and is just steps from the beach in a quiet residential area. The view from the top deck is beautiful, especially at sunrise over the ocean and sunset over the bay. Nearby parks for when the kids got a little bored and spectacular views of the ocean, bay, and the birds if you're inclined to photography. Owners were easy to work with and many extras are provided at the house such as beach chairs, toys, and numerous beach passes. Would rent again. Thanks Deb...Great having you. Come back. You should check out September! This is out third consecutive year staying in this house for two weeks in the summer. We come back for a reason. Everything is exactly as advertised (if not better). The owners are great and easy to deal with. The house is just perfect for my family. We have three sons one of which is married with two young children. (The floors all have child gates on the stairwells which is a nice plus.) Everyone comes down as their schedule allows and when all are there with their significant others we have 9 people in the house. The house EASILY accommodates everyone and with three large decks, and a huge top floor dining/family area the house seems twice the stated size. The huge dining table makes for great family dinners and late night board game play. 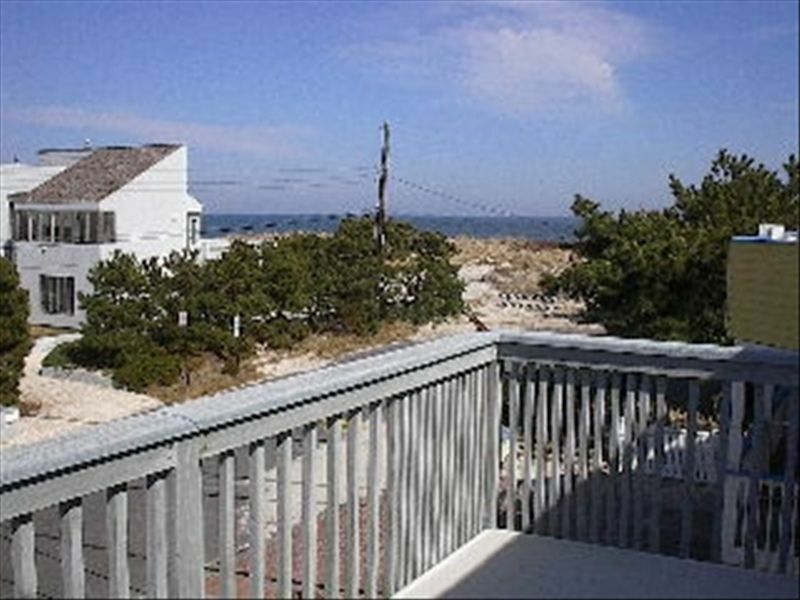 The roof deck has clear bay and ocean views and the sunsets are a nightly "must see" for all. You can see from the Lighthouse to the Causeway and beyond from the large seating area up top. Whether a Cigar and a Bourbon or just beautiful starry nights are your idea of relaxing, the roof deck is he place to be. As far as the beach, it is literally a 60 second trip to the beach from the front door. The location beach wise is as ideal as any on the island. Beautiful dunes, deep beach, lifeguard station 50 yards from walkway onto beach and NEVER a crowd like the more central or southern located beaches are. The street is quiet and isn't invaded by anyone other than the residents of 85th street. New couches upstairs this year added to the comfort level. Last year all decks were painted and resurfaced. every year the house is kept up and something added or freshened up. I honestly can't think of a negative. Neptune Market is a GREAT package store (TRY THEIR CRUMBCAKE!!!) that is one block away. If you want a great gourmet meal Black Eyed Susan's is our fave and its just two blocks away. The Harvey Cedars park is a great spot for bay sunsets, crabbing, and has an awesome playground for the kiddies. I'd tell you more but I need to contact the owners and book our two weeks for next year before YOU DO! large families with ease. During our stay we had the youngest refuse to go in the ocean (too rough for her). Take note for young ones there is a town beach on the bay at E 75 Street that is simply Heaven for tots. their help in making this a truly Family memory for years to come. Great having you. So happy you found the bay beach. Its a hidden gem. Its not only fantastic when the surf is too rough, its also key when a westerly winds bring green heads onto to the main beach. Going to the bay beach escapes them Lots of similar secrets all Harvey Cedars bay front. Next year make sure to go to Sunset Park with a picnic dinner for the weekly band at the gazebo or crabbing back by the old resort.. This house was perfect for our family plus my mother, sister and brother-in-law. The layout works perfectly for a combination of families, or even just separating kids from "grown up" time. No one ever felt crowded. The very large table in the kitchen/dining room was a great spot for family meals and board/card games. The location cannot be beat - the house is just a few in from an entrance to the beach, and there is a choice of guarded beaches either way from that entrance. The views from the decks are beautiful, and we never saw sunsets as gorgeous as we did from the decks, or from our quick nightly walk down to the ice cream shop. Everything was as represented in the listing. This was our first experience with VRBO, and I was a little nervous all the way until we were in the house, but everything was as represented and the landlord was responsive throughout the whole process. It was also our first experience going to LBI - the northern end, where this house is located, is a great location for families. The street was very quiet, and just perfect for a relaxing family get away. Local park (Sunset Park) is nearby with playground, baseball field, basketball court, tennis court, fishing/crabbing pier, picnic tables and bay access. Weekly concerts are very nice in the evenings. There are marinas five minutes north and south of the house with sailboat, kayak and motor boat rentals for bay excursions. We suggest and offer a cleaning service which costs $150. We require it for nearly all first time renters.